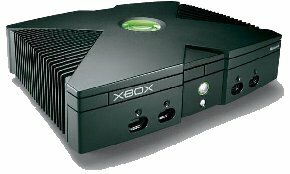 Ordinarily, a subscription to Microsoft's XBox-Live service is required for on-line gaming with the XBox, but it is possible to use third party systems such as XBConnect and Gamespy, both of which require another PC to be on the same network as the XBox which then, in effect, becomes a proxy for the XBox. But enough of frivolities. Before we can do any of the above your Xbox needs to be connected to either your Cable Modem or your network. The network interface on the Xbox is a conventional DTE 10BaseT interface so can be connected to your broadband network in the same manner as any PC. In other words, a straight CAT5 cable is normally all that is required, although if you are just connecting to a NIC on a PC, then a x-over cable will be necessary. The following diagrams show scenarios for Xboxes where either a straight cable is needed or a x-over cable is necessary. It is also possible to use a wireless connection with an XBox through the use of an Ethernet/802.11x adapter such as an SMC SMC2670W Ethernet/Wireless Adapter or Linksys WET11. This would then allow your XBox to use your existing Wireless Network. If your XBox is connected directly to a Cable Modem or STB there is a need for the Cable Modem or STB to know the MAC address of the Xbox. The MAC address of a device is a 12 digit hexadecimal number that is unique to each ethernet device and NTL configure their cable modems and STBs to only connect to devices whose MAC addresses are known. With an Cable Modem there is a maximum number of two MAC addresses that the Modem can talk to, whereas with an STB the maximum number is five. With an external Modem, all that is needed to connect an XBox to the modem is that the Modem and PC require switching off and the RJ45 cable removed from the PC and then connected to the XBox. Once done, switch on the Cable Modem and wait for it to synchronize with the Head-end. Finally, switch the XBox on and assuming that your XBox Live set-up is for DHCP, it will obtain an IP address from NTL. For an STB, you need to configure the MAC address of the XBox via the 'start.ntl' URL, where the MAC can be registered as a device. It is also possible to clone the MAC address of an exisiting cable connected device via the XBox Live set-up, which will allow use of the XBox without having to switch off modems or add MAC addresses to the STB. Note: If your XBox resides on your LAN, behind a router or Gateway PC, then the MAC address issues discussed above are irrelevant! More often than not your XBox will just need to use DHCP in order to get an address (this is most important when connecting direct to a Cable Modem or STB) but in the instance where a DHCP server is not available, it is possible to set a fixed IP Address via the Xbox Live set-up. This address must be compatible with your existing IP Network addressing and the XBox's default gateway needs to be set as your network's gateway address. For example, consider a network with a couple of PCs behind a Linksys Router. By default, the Linksys Router will have an address of 192.168.1.1, and the PCs, if using DHCP, will have 192.168.1.100 and 192.168.1.101 respectively. In this scenario, the XBox would get an address via DHCP but if there was a decision to fix it's address, then it also would need an address on the 192.168.1.x network and it's default gateway would be 192.168.1.1. When setting the address on the XBox be aware of existing addreses on the network and avoid use of addresses in any DHCP range used. For the Linksys in our example, this would mean addresses 192.168.1.100 to 192.168.1.149, inclusive.